NoShootFoot: So, Osama Bin Laden Is Dead? I guess we're supposed to be rejoicing now? But I can't rejoice with a clear conscience yet. There are just too many unanswered questions. And maybe – just maybe, Osama bin Laden could have answered some of those questions. I don't have doubts about the death of Osama bin Laden. Yes, the assassination story sounds a little fishy, and so does the burial at sea. The burial at sea left no remains to check, but also no place for mourners to congregate. And most likely, just as officials have said, no country would take him. The unarmed guy the Navy Seals shot in the face was most likely Osama bin Laden. And if it wasn't, Osama bin Laden has probably been dead for years now anyway. No. My unanswered questions are not about Osama bin Laden's death, but about his life. My doubts remain on the “Osama bin Laden – 9/11” story. Was the story the press told us real or fabricated? Did Osama bin Laden really mastermind the 9/11 attacks? Was he even a terrorist? Or was he just a boogey man for us to blame? I got the feeling that the Bush administration really liked having Osama bin Laden around. He was great for their ratings in the polls. And you may remember that all Bush Jr. had to do was mention the name of Osama bin Laden – and he would instantly get his way. 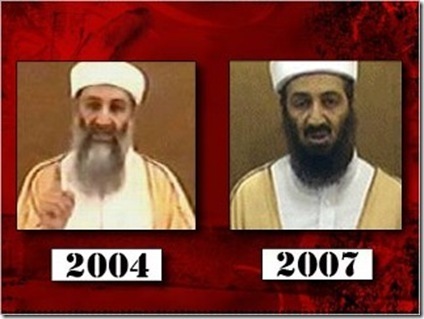 ...But now; here we are – almost a decade later, and Osama doesn't get us all worked up anymore. Slowly, the scales have tipped; and the public relations machine may have realized that Osama was worth more dead than alive. Or maybe his name just sounded too much like Obama to let him stay at large. Or then again, maybe it was just a coincidence that they killed him now. The timing of this event should put to rest some possible speculations. We're not near an election; so I don't think it's a stunt to make President Obama look good. It's been over two years since President Obama became President. So it doesn't make President Bush look bad. But we needed some good news. Americans have tired of these “wars” that look more like occupations. We don't really have anything against these Muslims. We don't want to pay billions and billions in taxes to be there. And it really saddens us to think that people are still dying – over what? Over what? Our nation's prestige? Personally, I'd like to see our nation have some legitimate prestige. No one really admires our willingness to fight forever to win, even if we're wrong. All these “wars” do is show America's tenacity to oppress. I don't call that prestige. But, of course, there are those in power who believe we have to be the “bully on the block.” And then, of course, there are those military contractors who are getting filthy rich on taxpayer money – and they need “wars” to keep the money coming in. Was this just a publicity stunt by the military/industrial complex? Have we just been thrown an (Osama) bone to keep us happy about our taxes (and warriors) being wasted? Maybe it just happened now... because that's just when they found him (again). Either way; Osama bin Laden is officially dead and Al Queada is more or less eviscerated. So, what does Osama bin Laden's death really mean? Or does it mean anything? I remember reading that Osama bin Laden hadn't been leading (what is left of ) Al Queada for quite a few years now. I find it highly unlikely that we will be seeing any troops coming home because of this. And there is still this nagging doubt in my mind that Osama bin Laden wasn't responsible for the 9/11 attacks. What if the skeptics that suspected that 9/11 was an inside job were right? What if Osama bin Laden was just a patsy? What if the Osama bin Laden story is a cover story for a takeover attempt of the United States? What if terrorism was the excuse necessary to take away our freedom – with the Patriot Act? What if terrorism was the excuse necessary to create a shadow government (Homeland Security), ready to take over when the conditions are right? What if we've been playing to these insiders' democracy hating hand for years? What if they have been emboldened by these events? What if they're planning their next strike? What if President Obama hasn't been told a thing about any of this? America is vulnerable, in Washington D.C. – 9/11 proved that. But there won't be another 9/11 attack with hijacked planes. Apparently, we're prepared for that now. I was watching a show on the History Channel about some possible, but not likely disasters animators could report on before they happened. One particularly interesting disaster they mentioned was about the potential for a “terrorist” nuclear attack on Washington D.C.
What if Washington D.C. were to be devastated by a nuclear attack. With the President, Congress, and the Supreme Court all dead, who would run our government? The Department of Homeland Security, I guess. If the skeptics' worst fears were right – if the 9/11 attacks were an inside job, and there really do exist “Americans” so heartless that they would plan a coordinated attack on the World Trade Center, the Pentagon, and possibly the White House (or the House or Senate); then nothing is beneath them. If there was a 9/11 conspiracy, they got away with it. If they got away with it, why not try it again? The insiders' next big false flag operation just might be a nuclear attack on Washington D.C. to destroy the last vestiges of our democracy and take total control of our country. In fact, the killing of Osama bin Laden may be a part of their cover story. Americans are now expecting a revenge attack. It has been a while since the 9/11 conspiracy theories so negatively effected our collective trust of American leadership. Maybe the insiders now think this has all blown over – and their opportunity for another 9/11 type of false flag attack is coming again. And with the assassination of Osama bin Laden, America is bracing for another “terrorist” attack. But personally, unless the alleged 9/11 insiders are not members of the American oligarchy, I doubt that Washington D.C. will be nuked. There just isn't a need. Our government appears to be giving in to the plutocracy's wishes now. So why bother? Remember, the Soviet Union never fell until Gorbachev and Glasnost. Remember, just when things started looking better for the common people in the Soviet Union, the Soviet Union collapsed. As long as the takers are getting away with everything – as long as Washington politicians and bureaucrats are for sale; why bother with another 9/11? Americans have lost control. Washington has been nuked – with money. And if we succeed at fixing things in Washington, someone just may wipe it off the map – and blame “terrorists.” But we have to try to fix America anyway. And, whatever we do; we better not allow the privatization of Homeland Security – not even TSA. How do we save Washington? By making it less important. So long as politicians and bureaucrats run our country, Washington will be vulnerable. If Americans were to hold elections on policy issues, however; Washington would just house administrators. If we had more real democracy, there would be no point in attacking Washington.